Lee Trevino, wearing a marshal's hat, pulls out a rubber snake and a hatchet in the rough during a practice round at the 1971 U.S. Open at Merion Golf Club. 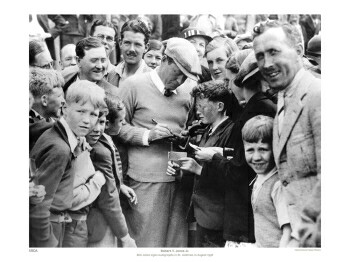 Gene Sarazen following his victory at the 1922 U.S. Open at Skokie (Ill.) Country Club. Ed Furgol sinks his par putt to win the 1954 U.S. Open on the 18th hole at Baltusrol Golf Club's Lower Course. Jones Wins 1927 U.S. Amateur at the Minikahda Club in Minneapolis, Minn.